The first international text acknowledging the specific obstacles that prevent people living in extreme poverty from enjoying their rights. Get your free copy of this handbook – click here! The adoption of the Guiding Principles on Extreme Poverty and Human Rights by the United Nations Human Rights Council in 2012 was a significant victory in the effort to end extreme poverty. It acknowledged that poverty is not simply a matter of lack of income. These Guiding Principles clearly identify actions that governments and other relevant actors should take to ensure that all people are able to enjoy their human rights. Click to download the Handbook. ATD Fourth World worked alongside our partners to complete this important document. The next step in our work was to translate these principles into language that everyone can understand and to suggest actions at the local level that groups working alongside people in poverty can put into place. In collaboration with a group of ten international non-governmental organizations active at the field level, we developed an implementation handbook on these Guiding Principles. 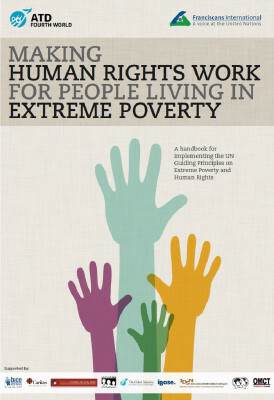 The handbook, entitled “Making Human Rights Work for People Living in Extreme Poverty: A handbook for implementing the UN Guiding Principles on Extreme Poverty and Human Rights” is for local actors, both those who work for the state such as social workers, community organizers, teachers, and urban planners, as well as those who work for non-governmental organizations and religious or community groups. Throughout 2014, the handbook was field tested in communities around the world. The final draft, incorporating the most important changes, was released in English and French in September 2015, with the Spanish version available by the end of the year. To learn more, you can contact our International Relations team in Geneva at the address below.